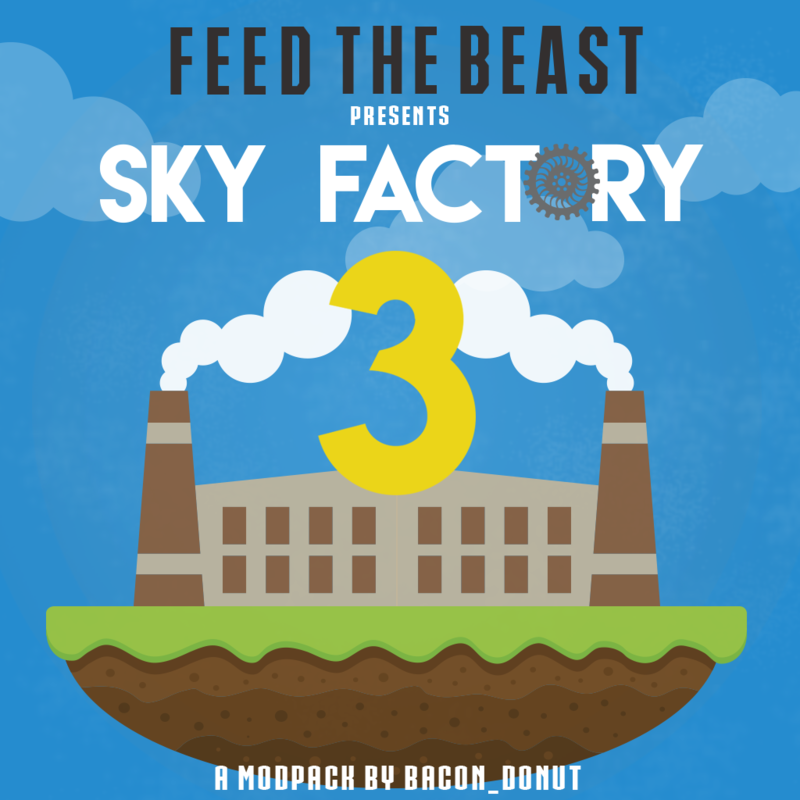 This version of Sky Factory is released primarily to allow for mod updates to fix or enhance many existing features. This update is using the latest Forge which SHOULD increase server and client performance due to optimizations. There should no longer be a crash due to looking at/holding a disk drive with a large amount of information in it. Added red coal from ExU2 as a carbon source. Built for newer forge and mappings, updated dependencies. Mod now syncs difficulty to each player on login (instead of only on server startup). Added player references to capabilities container and added checks for item validity. Fixed FluidMultiHandler.fill messing up passed in fluidstacks. Built for newer forge and mappings. Added the Altar's Charge value to the Waila Tooltip when holding a Seer's Sigil. Added Fluid routing to the routing nodes - this is done by using the Fluid Filter and placing a fluid container as the filter. Added a null check for the Will getter for the Aura incase the WillChunk somehow does not generate. [API] Added a new IMC API for modders to register their blocks as an altar component. Example: Chisel Glowstone can now be used for the Tier 3 caps (once Chisel implements it). Added a new Master Ritual Stone that inverts it's redstone activity. Added some caching to rituals to (hopefully) increase performance with less world data query-ing. Empty flasks can now be refilled to create a new flask. Blacklisted Sentient Spectres from the Well of Suffering. Made it so the book does not give the filling recipe when the Blood Orb recipe is queried. Downgrade tomes are now called Downgrade Tomes. Fixed the Living Armour Sacrificial Upgrade. Fixed Bound Tools not draining LP. Fixed Aura of Expulsion whitelist. Fixed meteor config error caused by EnderCore reloading configs early into startup. Fixed meteor config not generating new entries. Fixed Sigils drawing from the user instead of the bound network. Fixed server crash when adding guide recipe to JEI. Fixed Living Armor attributes overriding eachother instead of adding up. Fixed Ore doubling sometimes adding invalid recipes. Fixed shift clicking in base container crashing client. Fixed a couple other bugs. Fixed rare race condition on audio packet receive. Fixed Poster "Unknown serializer type" crash. Fixed grabbing the chest from a minecart not removing the chest. Fixed the player being teleported when placing a chest into a minecart. Implemented compatibility with BloodMagic for tranquility and runes. Added new stained glass textures. Config for showing variant names in item/block name is now functional. Updated the JEI plugin, new features in API were implemented. Updated FTB Utilities' guide page. Size of model cache was increased, should result in more RAM usage but a smoother experience overall. Fixed a crash on world exit. Fixed a crash when left clicking a chisel. Fixed an incorrect break animation rendering. Fixed bad CTM in some cases (this improved performance of CTM slightly). Fixed carpet break speed being too high. Improved on lag fix from last release, should be even better now. Applied a workaround for an issue causing various mods with fake block rendering (iChisel, C&B, ImmersiveEng) to show pink&black models. Fixed an issue when trying to read models that have a null override. Fixed cross world format not converting primary state. Fixed an issue where thousands of orbs were generated. Fixed some log entries, and removed some. Mod now also matches ItemStacks when either of them have a wildcard damage value. Fixed match flags not being used during item extraction. Fixes for JEI (needed for Deep Resonance). Made it so that if you press ctrl again it takes the menu away. Disabled Mouse Tweaks in Cooking Book / Cooking Table GUI. This should fix the list constantly changing while scrolling with the mouse wheel. Fixed cow jar JEI recipe showing cow jar instead of milk jar as input. Fixed oredict toggle in craft matrix going too fast. Fixed spam in server console when running /help. Fixed JEI support not loading. Removed a call to a deleted method. Reverted to old code for RecipeTransformers, this should fix some issues. Fixed a crash on startup regarding JEI. Fixed an issue when mobs are captured into the mobdrop list. Replaced the base black stone texture with an original texture. Updated all of the trap and vector plate textures to contain the new black texture. Vector Plates upgrades are no longer free! Sneaky Block recipe uses Dwindle Cream. Fixed Pearl Blocks dropping wrong meta. Attempted fixing enderman glitching out when teleported using the tether. Re implemented comparator support for the energy core. Re implemented the "Flight Lock" option in the Draconic Chestplate. Re implemented the "If you disconnect while flying you will be flying when you re connect" feature. Added support for Dragon Mounts Dragon Eggs. Removed upgrades from armor pieces they dont belong on (e.g. : jump boost on helmet). Energy core build guide now shows invalid blocks. Tweaked fusion crafting. Each Icosahedron will mow fade into existence as the injector its attached to charges, thus making it easy to see if one or more ore injectors are not getting power. Loot core now fires an item pickup event so things like backpacks which collect items as you pick them up should work now. Fixed shift clicking in Energy core gui causing a crash. Fixed particles from pylon sometimes targeting wrong core after switching between cores. Fixed issue with energy pylons breaking (I think...). Fixed contributors wings not working on servers unless you login to a singleplayer world first. Fixed advanced dislocator using health instead of fuel when teleporting entities. Fixed advanced dislocator not teleporting other players. Fixed an issue the prevented the generator from sending energy to some blocks. Fixed dragon mounts integration crashing server. Added icon source to repo. Added a check for duplicate recipe IDs. Added special output for legacy item handling. Should allow to extract buckets from the Stirling Generator, and items from the Killer Joe. Added breaking animations for all Ender IO machines. Removed silent upgrade specific recipe, and fixed generic upgrade recipe (including silent ones). Replaced fuzzy mode with damage mode. Enabled travelling on a Dark Pick with a Travel upgrade if block placing is disabled. Applied generous shaving to some CPU cycles. Mod will stop asking blocks if they can render their breaking animation, they don't like that. Fixed spoon upgrade on Dark Pick when used in snow. Fixed recipes requiring ThermalFoundation items (for 1.10.2). Changed from ModID to ore dictionary in recipes requiring Pyrotheum Dust. Fixed shift-clicking moving to multiple targets. Migrated the Ender Pouch to CCL's new bakery pipeline, should fix most model churn issues. Fixed a bug where the console was spammed by null pointers when you crafted something with meta values. Added "clicks per second" option for the Heavy Sieve, in case you miss the super-speed sieving. I'd leave it at default for bigger servers though, to discourage click spam. Removed bundled COFH API and COFH support (seems like it was causing issues with another mod, and every RF mod should support Forge Energy by now), also renamed RF => FE in GUI screens. Allowed the chicken stick to hammer compressed blocks as well when whitelisted in ChickenStickRegistry.json. Fixed Extra Utilities' Compressed Blocks no longer working in the Sieve & Hammer in latest Extra Utilities' versions. Fixed rabbit bait accidentally promoting cannibalism. Fixed rabbit bait not actually working due to lack of environment data. Fixed compressed hammers destroying unhammerable blocks instead of dropping them normally. Possibly fixed an issue where dead compressed mobs would still be counted as occupying an area, causing problems with baits and EnderIO's powered spawner. Fixed a crash when placing bait. The One Probe is now supported by default. A new config (disabled by default) now allows sieves to "drop" their items into chests that are below them. Fixed: Buckets can now fill half-empty barrels. Fixed: Configs will now actually be loaded by JEI, instead of not. Fixed: Redstone dust should hopefully no longer fly around randomly. Fixed: [Internal] Ex Nihilo configs now fire RegistryReloadedEvent, allowing other mods to change things afterwards. Fixed: Ore chunks are now oredicted to "oreNAME". Fixed: Ore dusts are now oredicted to "dustNAME". Updated to newer forge version, hopefully fixing some compatibility issues. Fixed: Meshes can be enchanted again! Rejoice! Fixed screen flickering in the Bit Tool settings menu GUI. Added Terraformer and Climograph system to change nearby biomes. Added Biome marker to store biome information. Right click to store current biome. Added a config option to /xu_powersharing GUI to enable/disable other players form accessing your XU2 inventories (disabled by default). Added a temporary crafting recipe for moon stone until the world gen is unbroken. Added 'Trash Chest' (voids excess items). Added 'Flat Transfer Nodes' (can be placed between blocks to transfer items/fluid between neighbours). Added 'Opinium' (stupidly expensive ingots used for crafting the Kikoku). Added a recipe for vanilla hoppers that uses 5 iron and 2 wood logs. Added restriction check to prevent vanilla squids spawning adjacent to tile entities (may break some squid farming setups but can be disabled). Temporarily disabled 'unloaded chunks GP tracking' since it caused GP use to randomly rise infinitely. Set 'synergy' blocks to disabled-by-default as they are not finished. Rewrote large sections of code to aid transition to 1.11+. Bugs have likely been introduced so this version will likely not be stable. Klein Flasks can now be placed in world. Zombies spawned by cursed earth will now have their 'reinforcement chance' set to 0. Cursed Earth will attempt to spawn mobs off-center. Rewrote sickle 'right-clicking' to allow harvesting crops to work with 1.11/1.10 changes. Due to 1.11 rendering changes, XU blockmodels can no longer be overriden (hopefully to be reenabled later). Dropped items are now always dropped as a single stack. Fixed textures being missing on some systems. Fixed null items in machine inventories (1.11.2). Fixed particle textures on the Turbine Rotor blocks. Fixed Transfer Limits not being respected when multiple senders/buffers are connected. Fixed abug when destroying flux connections and placing a different block in the same position. Fixed bug when a user is unable to connect a Flux Controller. Fixed EU energy transfer not working. Fixed crash when removing connections. Fixed Network Stats not being synced. Fixed Client crashing when right clicking the Player Name field. Fixed Flux Storage Tool Tip Error messages. Fixed Servers Lagging like mad, related to Sonar Core. Fixed energy seeming to stop charging after a while, requiring the block to be broken. Fixed crashes at random intevals, related to Sonar Core. Fixed "Add player" button not working. Fixed glitch with info being shown for connection even when it isn't being hovered over. Implemented Cache BlockInfo lookups in ChunkInfo objects. Fixed an NPE in patchOtherClass. Added support for dynamic baking of 3D item models on demand, saving RAM. Expanded transformer blacklist to save some loading time. Tweaked around the deduplication behaviour. Allowed to use the admin_unclaim_all command in SSP. Renamed some permission nodes, possibly fixed issue where OPs can't unclaim other chunks. Added WIP Tinker's Construct integration. Compressed all different image/texture providers into one, IImageProvider, fixing guide images. Fixed a bunch of potential crashes with fake players. Fixed a crash with the Tinkers Construct Guide page. Fixed an occasional crash on login. Added IconSet, ModelBuilder, SpriteSet, BasicConfigContainer and ItemListLine. Added hr and list lines, made some changes to how lines/their widgets are created. Fixed some command permission issues. Fixed some commands not working with offline players. Fixed ISidebarButton sorting, ItemListButtonLM item information hover. Fixed some server crashes, added FinalIDObject id rules. Fixed first_joined & last_seen stats not working. Fixed unicode character rendering in guides. Fixed sidebar button alignment with potion effects. Started working on Warps GUI. Reworked reloading, started working on Teams GUI. Fixed/implemented new ranks system, added IFTBLibPlugin#configLoaded(). Added ConfigFile.NULL_FILE_PROVIDER, LMUtils.FORMATTING_CHAR, and disabled html escaping for LMJsonUtils GSONs. Fixed BlockLM & ItemLM registry IDs, ProperyShort and PropertyByte incorrectly trimming numbers. Added support for running things on mapping. Fixed a crash when clicking the next/prev page buttons and the book is on a page number that no longer exists (for example, due to the contents of the entry being changed in an update). Made onInit in EntryAbstract always be called at least once when an entry's contents is viewed, to allow for changes to be applied without closing and reopening the entry from the catagory GUI. Fixed a bug where tanks can be corrupted in some rare circumstances. Fixed a bug where tanks can lose their contents in some rare circumstances. Added new rooster only breeding option (WIP; not really compatible with modded chickens). Wrenches can now turn nesting pens without losing the chicken and items. Switched support from just WAILA to HWYLA (which is a continuation of WAILA). Made sure old mating AI was getting replaced with new AI. Nesting pens no longer lose items on world restarts. Fixed rooster breeding not working correctly if the eggbreeding config was false. HWYLA support updated, also fixed the spam in console and causing players to get booted from servers. Eggs no longer give you a chance to get 5 chickens in one egg.. not sure how that got in there. Temporarily disabled the capability handlers. These were using too much data on the network when looking at large inventories. They will make a return once I can re-implement them in a way that avoids that. Fixed duplication of stacks of items dropped onto the bottling machine. Fixed the manual entry of the Fluid Pump citing the use of "wirecutters" instead of a "hammer". Fixed a manual typo in the fermenter entry. Removed an invalid number casting, fixing a crash. Improved efficiency of remapping chunks, reducing overall CPU usage. As a result, removed the "Surface Min Render Distance" and "Cave Min Render Distance" options. Fixed: Cave and Nether mapping sometimes showed void color near Y=0. Fixed: Topo maps errored when bathymetry enabled. Fixed: Cave map didn't update consistently. Added a way to add ItemStacks to JEI during runtime. Removed progress bars for ingredients (it was making load time longer). Mod now checks that plugin's IRecipeHandler.getRecipeClass() is valid. Fixed a crash from empty categories that have recipes added by CraftTweaker. Fixed recipe issues in a previous commit. Fixed: Mod now properly reports items given by JEI, for server admins. Added explicit dependency on Forgelin. Made BoP Hellbark Stepladder not catch fire. Fixed a crash caused by BoP stepladders catching fire. Fixed an issue when loading Configuration files that contain non-existant block entries. Added support for reading large energy values from Draconic Evolution, Mekanism, and EnderIO. This will fix the rftools energy monitor and screen modules. RFTools screens with truetype support will now support color codes again. Implemented some handy debug tools for mods using McJtyLib. Can be used to dump info on held items and blocks that the player looks at. Latest RFTools will use this. Various improvements for the upcoming XNet mod. Fixed a bug with block tooltips (in inventory) on 1.10.2. They didn't show up. Fixed parts being sent to the client on NBT load if the world is already set. Added packet splitting - should stop the game from kicking you out of the world/server if something sends a really large packet (like really complex Super Circuit Maker builds). This will be the final release for 1.10 unless something really major comes up. Added an event for cancelling zombie reinforcements if it's killed by the mob masher. Fiddled with item capabilities, to try and stop absorption hopper upgrade slot being extracted from machines. Changed some textures, because it was requested for them not to be based on resource pack originals. Added the ability to edit the configs ingame, you still need to restart for them to take effect. Added decorative storage blocks for all the ingots. Used to convert your extra seeds into essence. Added complete JEI support for it. Added decorative blocks: "Mystical Machine Frame" and "Glowstone Lamp". Added Mining and Attack AOE charms; makes Supremium tools mine a 3x3, and swords attack in a 5x5, can be disabled in the config. Replaced the textures of all blocks (except crops) with new 16x textures. Fixed the "set_bonuses" config option affecting the Supremium Armor flight ability. Fixed load order issues with crops/essences/seeds that prevented some things from working. Fixed EnderIO seeds not checking for the correct mod being loaded. Minor tweaks, also added fast transfer blacklist for GuiContainers. Mod now allows 512x512 icon dumps. Fixed a crash when clicking on Water to see recipe. Fixed a model error which was appearing after updating to a more recent forge build. Mod doesn't show selection box on lights anymore. Now supports tesla and forge on items. Mixin system now allows more than one mixin per class. Added item power bar to the mixin. Added a mixin to allow RGB damage bars. Added a warning if the mixin manager failed to load. Re-enabled the mixins, let me know if there are still issues. Major: Tile power pushing, when the tier is too high, the tile trying to push the power smokes. Added a crash handler, to show info about some common issues. Added a messy way to handle static methods. Removed test crash, nothing to see here. Some small tweaks to the MixinTransformer. Fixed some issues with the power config. Fixed some issues when running outside of DevEnv. Applied a fix for mods using SpongeMixins, that target the same classes that Reborncore targets. Fixes a crash when trying to use the ReplayMod. Fixed compile issues from merging back. Fixed PowerAcceptor integration with TOP. Applied some small quality of life tweaks like showing how many pages are in the whole multiblock in the gui. This update should fix some weird issues with the inventory. Added integration for Collosal Chests for the External Storage, the Importer and the Exporter, improving performance. Added Grid sorting by ID. Exposed the Network Card inventory of the Network Transmitter so other tiles can interact with it. Increased the size of Detector textbox. Mod now handles breaking and placing blocks better for Constructor and Destructor. Updated back texture of the cable part, and the Construction and Destruction Core textures. Fixed stack upgrades not working in exporter when stack size is 16. Fixed a crash when rotating External Storage. Fixed disk textures not working on latest Forge. Fixed a client side crash related with cables. Fixed a crash when placing a head/skull with a Constructor. Fixed recipe for Processing Pattern Encoder not using oreDictionary for the workbench. Fixed Fluid Interface not dropping inventory contents. Fixed glitchy upgrade recipes in the Solderer. The bad one: if receivers/transmitters are added/removed/changed you will not see it in a gui that is already open. Mod now uses getMetadata() instead of getItemDamage() at relevant places. Added debug keys to dump NBT for items and blocks. Added a more descriptive 'crash' when some mod tries to insert/extract energy from the powercell in client mode. Implemented a few safety fixes to protect against 'bad mods'. New Open Computers support. Drivers already included: endergenic, pearl injector, powercell, liquid monitor, rf monitor, coal generator, matter transmitter, matter receiver, dialing device, and machine infuser. Working on fixing the elevator for chisel blocks and other blocks that need more render layers (bug came up in recent versions of chisel). For a Builder with pump card: if there is no valid place for the liquid to go or the tanks are full then the builder will wait instead of skipping to the next block. A few areas were optimized a bit. Added: New hex mode in parameter editor to make editing colors easier. Fixed a bug where marking a craft request Ok but not giving an item did complete that request but prevented further requests in the same batch (i.e. a count > 1 was given in the crafting station) from being requested. It is now possible to extract/insert items from the processor generic buffer with hoppers/conduits/whatever. Makes some kind of automation easier. Made screen selection in the vector art module more accurate. Fixed a problem when an event wasn't immediatelly able to be processed because there was no available core then optional parameters for that event would not be used when the event was later executed. Added better protection in case there are too many events at the wrong time. Fixed a crash during dimension creation that could occur when random mobs were selected. Added @Mod, removed loading plugin. Added translation to French, both from France and from Canada. Potentially fixed issues with multiplayer achievements (randomly sharing data between users) . Fixed parsing of data file when there are blank lines or extra spaces (should ignore them now). Changelog maker note: Developer archives older versions, whatever was added between 1.2.1 and 1.3.1 is not accessible. Important performance fix, Server Performance should increase noticeably. Fixed strange crash with Flux Networks when destroying a Flux Plug and placing a different block. Fixed crashes when placing items into inventories. Added config to disable timed crafting. Lowered the player when sitting in a cart. Fixed some issues with the detector, and some other minor changes. Fixed cart stopping when a player got in. Changed the way the cart gets the next valid datawatcher, hopefully fixing a bug. Fixed crash with thermal upgrade. Should fix all issues with the cart not being able to be placed into the world. Fixed: Riding a pig cart crashes the game. Added Storage Downgrade, limiting storage to one stack. Can be combined with storage upgrades. Added Key Buttons, which can be placed on controllers and slaves and act like using a key on a controller. Added default compacting rules for nether wart and red sandstone. Fixed compacting tier MineTweaker API not working. Fixed ore blacklist/whitelist/compacting tier options not taking effect when modified in-game. Fixed drawer upgrade slots from accepting any item. Fixed drawers accepting redundant upgrades. Fixed the quantify text fade. Changed Cloud Rendering to not use ASM. Seared furnace now removes mobs that spawn inside of it. The Reinforced-Modifier book page text states the correct item now, instead of an obsidian plate. Added all new Flint and Bone tools for a later date. Added Stone Dust for a later date. Added Bone and Flint armor for a later date. Added bone block and flint ingot to oredict. Added a config for the skull drops. Added Dirty Glass and Reinforced Obsidian to Ore Dict. Added tooltips to all Cobblegens. Added a tier 3 Growth Crystal. Reworded the config file to make it easier to understand. Redid the config file to make it easier to read. Added a config option to turn up or down the growth crystal particals. Changed Textures for Growth Crystals. Changed the Bucket Event to try to fix another mod. Changed the Config handler to match the config. Changed recipe for the birthday pickaxe. Changed tier 1 Growth Crystal to new texture. Changed the code for the bucket event to try and stop weird crashes. Changed the way Growth Crystals were rendering to fix a render glitch. Changed code to try and fix recipes sometimes not working. A note from the developer: "#BlameDarkosto *flips table over*"
Changed the way to make Flint/Bone tools for now. Will add a config option later so modpack makers can pick which recipe to use. Fixed the Distance on growth crystals. Fixed the Charcoal Block recipe. Fixed a few other things. Added a config for setting the item used to set the Translocator to filter mode (Default: Diamond Nugget). Applied Energistics 2 Integration is now back. A lot of small improvements on UniDict. Fixed one ingot becoming one gear in Immersive Engineering's Metal Press, related to IE's integration. Regenerated the Scanner Mod's config file to alleviate potential conflicts. Ender Tethers should no longer make an annoying sound in mob farms by repeating the same teleporting audio clip in rapid succession. Reduced the amount of liquid iron and gold you get when melting spikes in a smeltery. Rabbit Bait should now have a proper recipe. The Mob Grinding Utils' spikes recipe should now give 4 when crafted instead of 1.